The Star Wars franchise is about awe—the wonder of new planets, a spectacular intergalactic battle between good and evil, really fast spaceships—and trying to capture that in chain-breakfast form is understandably challenging. I myself would find it difficult to convey anything epic in the medium of hash browns or sausage links. But Denny’s tried anyway. 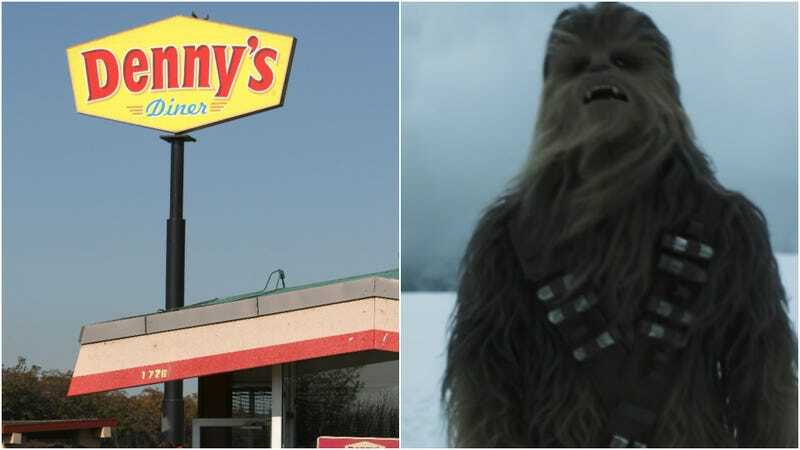 Nation’s Restaurant News reports the chain’s limited-time promotions tied to the forthcoming movie Solo: A Star Wars Story have already debuted and will remain on the menu for about three months. Alas, they sound less George Lucas and more lukewarm. One special menu item available now is called Two Moons, and it’s a—drum roll—skillet breakfast with cheese sauce and two eggs. Or take the Lightspeed Slam, which is just an egg-white scramble with English muffins. If you’re going to take on a franchise as beloved as Star Wars, you’ve got to go big, Denny’s: Pancakes shaped like Chewbaca! A waffle replica of the Millennium Falcon! Something with light sabers! Bizarrely, the new menu also includes the Co-Reactor Pancake Breakfast: “two buttermilk pancakes topped with fresh strawberries, strawberry sauce, and whipped cream, plus a side of Crystal Crunch Rocks and a pitcher of warm citrus sauce to pour over your pancakes to make ’em go pop.” Pardon? Whipped cream and orange juice-Pop Rocks pancakes, you say? Pretty sure I already invented these while stoned at 2 a.m. in college, and it had nothing to do with Star Wars. One nice silver lining to otherwise meh cross-promotion is the donation of proceeds from the sale of Denny’s Solo trading cards to No Kid Hungry, an organization that aims to reduce child hunger in the U.S.
Our advice? If you have the time, make your own breakfast out of the BB-ATE: Awaken to the Force of Breakfast and Brunch cookbook, endorsed by the biggest Star Wars nerd we know.